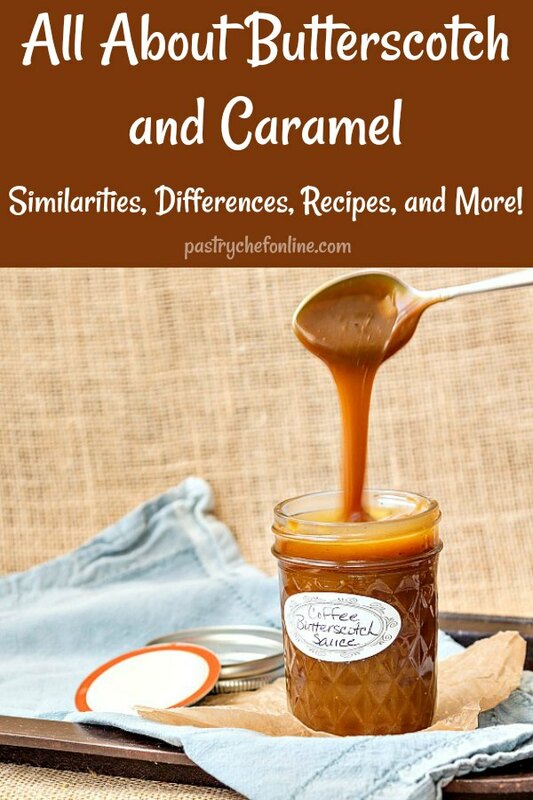 So many people ask what is the difference between butterscotch and caramel that I thought I’d write a post about it. Butterscotch is a distinctly different flavor than caramel, but people often confuse the two or even think they are interchangeable. Read on to find out the similarities and differences between caramel and butterscotch. Find all my butterscotch recipes in one place here. Before we look at the difference between butterscotch and caramel, I’ll take a minute to define butterscotch and caramel. Feel free to use the table of contents to jump down to sections you are most interested in. 3 What is the Difference Between Butterscotch and Caramel? 6 Why Does Store-Bought Butterscotch Pudding and Ice Cream Topping Taste So Awful? 7 Can You Show Me How to Make Butterscotch? 8 Do You Have Any Other Butterscotch Recipes? 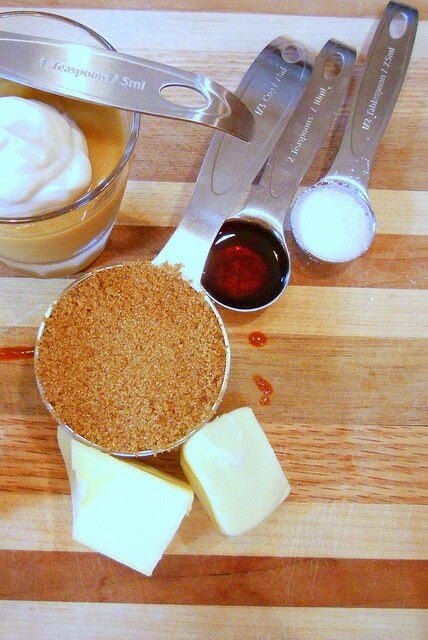 The ingredients you need to make butterscotch. The vanilla is optional, but you absolutely need the brown sugar, butter, and salt. Butterscotch in its purest form–candy–is similar to caramel but differs in three main ways. and it also contains some syrups that are the by-products of sugar manufacturing. Back in The Day, it was treacle or molasses, and today it usually means dark brown sugar (since today’s brown sugar is nothing more than refined white sugar with some molasses mixed back in). I found reference to a recipe written in 1848 for Doncaster butterscotch calling for a pound each of sugar and butter and a quarter pound of treacle. I cooked it up as a soft candy (although technically an old-school butterscotch would be hard candy. And I added salt. Quite a bit, actually. True butterscotch should have a bit of a salty edge to help round out the mellow butter and sweet sugar as well as to cut any bitterness from the molasses (which is pretty much just a dark treacle). Plus, since butterscotch contains so much butter (traditionally equal to the weight of the sugar), and old school butter was salted, it stands to reason that there’d be plenty of salt in butterscotch. I consider it an integral part of the flavor profile. 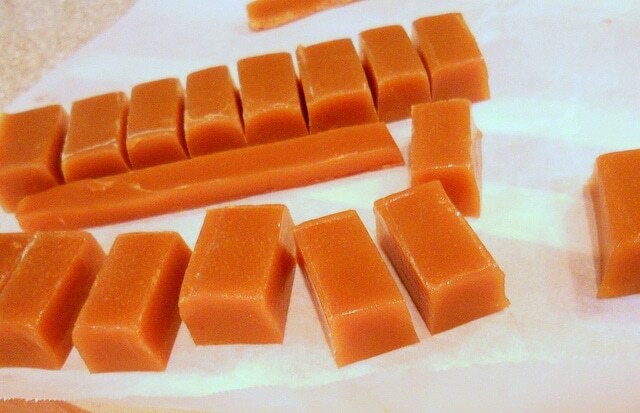 Here is how the old-school butterscotch candy turned out. Again, I made mine chewy rather than hard. It’s just about what temperature you cook it to. It is not necessary to caramelize the sugar in soft butterscotch candy. The ingredients are cooked together to between 248F-265F, depending on how firm-but-chewy you want the texture, and sugar doesn’t caramelize until well over 300F. I should note that while it’s not a necessary step, in order to get the most intense butterscotch flavor, it is ideal to cook the butterscotch mixture (butter and dark brown sugar) together until the sugar caramelizes. 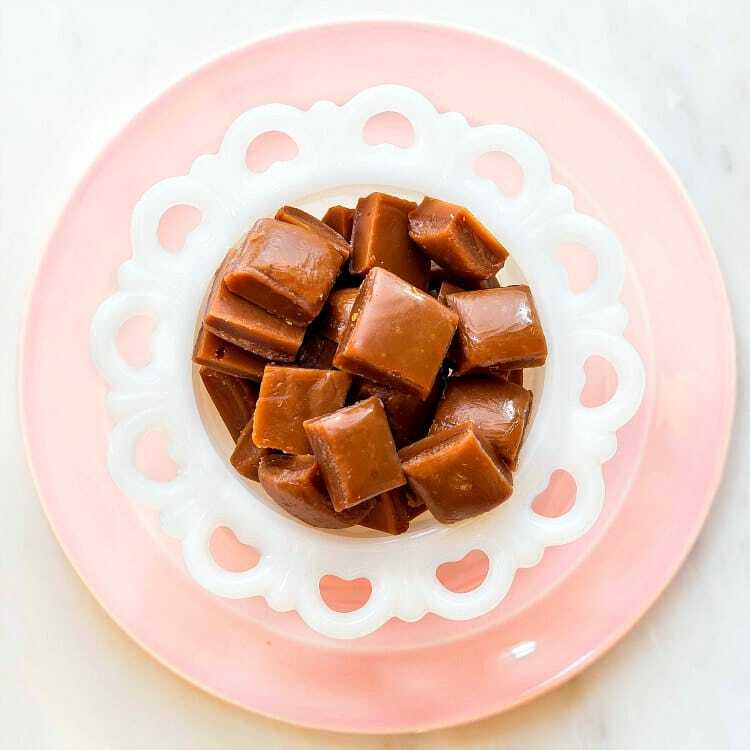 If you are making a butterscotch sauce or butterscotch hard candy, you’ll cook the butter and brown sugar together until the sugar caramelizes and the butter browns. That’s what gives you the base “butterscotch” flavor. What is butterscotch? The magical marriage of caramelized sugar, browned butter, and a hint of molasses. Caramel contains white sugar that has been taken to the caramel stage. It can contain dairy, but you can also make caramel with other liquids such as wine or fruit juice. It may or may not contain butter, vanilla or salt. (But it should contain salt). The distinctive caramel flavor comes not only through caramelization of the sugar but also some complex Maillard reactions between the sugars and the milk proteins over a broad range of temperatures (as the caramel heats and cooks). What is the Difference Between Butterscotch and Caramel? The main difference between butterscotch and caramel is that butterscotch is made with dark brown sugar (white sugar + molasses) and a high proportion of butter. Caramel is made with white sugar and a relatively small proportion of butter (and you don’t have to add any butter at all if you don’t want to). Butterscotch is also saltier than caramel, simply because it contains more butter, and “back in the day,” almost all butter was salted to extend its shelf life. More butter equals more salt. If you are interested in making a lot of caramel and butterscotch–or any candy, really–there’s some equipment you’ll need to make your life easier. Here are my recommendations for equipment and a couple of books to help you make delicious candy. I cannot recommend strongly enough that you purchase a kitchen scale if you don’t already have one. I have an Escali Primo I’ve used for years and it has never failed me. It’s reasonably priced too, which is nice. I also think an instant read thermometer is vital, and not just for making candy. I use my instant read for everything from checking the temperature of oil for frying to testing to see if cheesecakes are done (165F) or even regular cakes (195-200F). For all candy making, a heavy-bottomed saucepan is pretty vital. They cook evenly and won’t warp at high heat. Get a 3 quart model with straight sides, because when you add dairy or other liquids to super hot sugar, it bubbles up. You want to make sure your pot is large enough that you won’t have any spill-overs. The flavor of butterscotch is characterized by a mixture of browned butter, caramelized sugar + molasses (or dark brown sugar in modern versions) and salt. The flavor of caramel is characterized by caramelized sugar independent of molasses, butter or even salt. Butterscotch sauce is made with dark brown sugar, butter, salt, and some cream. 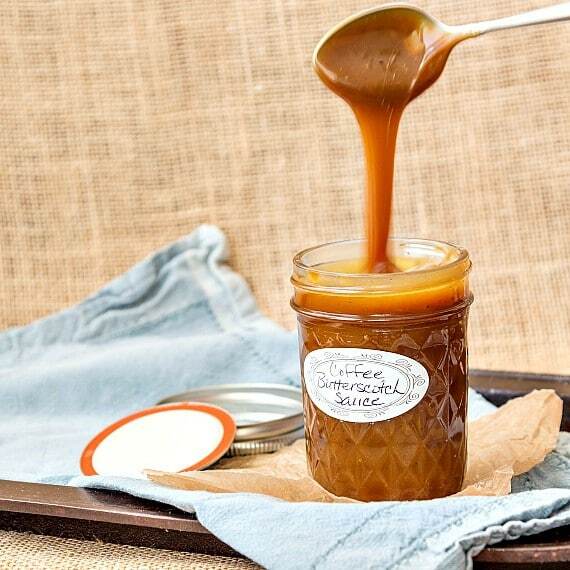 Caramel sauce does not have to include butter, but butter is an integral part of butterscotch. Both butterscotch and caramel can come in sauce form, candy form, pudding form, cake form, etc. Why Does Store-Bought Butterscotch Pudding and Ice Cream Topping Taste So Awful? Thank You Brand Butterscotch Pudding: Skim Milk, Water, Sugar, Partially Hydrogenated Soybean Oil and/Or Canola Oil, Corn Starch, Mono- and Diglycerides, Salt, Artificial Flavoring, Sodium Phosphate, Sodium Stearoyl Lactylate, Artificial Coloring (Yellow 5, Yellow 6, Red 3, and Green 3). Can You Show Me How to Make Butterscotch? Please watch the video in this post. 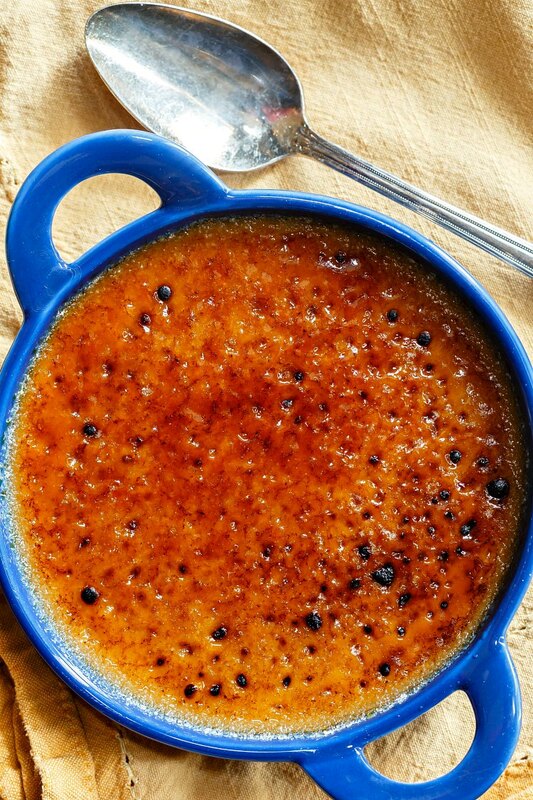 It’s the recipe for butterscotch creme brulee, and in it, I show you how to make butterscotch for the base of the recipe. Again, and in a nutshell, you cook butter and dark brown sugar together until the butter has browned and the sugar has caramelized. Do You Have Any Other Butterscotch Recipes? I do! I have a page where I am collecting all my butterscotch recipes, so check back frequently. Since it’s my favorite flavor, I’m always adding more! Over a cuppa joe that’s been adulterated with Land o’Lakes white hot cocoa powder, I read this post and discovered that my beloved Grandmother K was making butterscotch – not caramel – all these years!! I’m still trying to digest the implications (along with all the sugars and artificial flavors in my coffee cup). Thanks for the clarification between caramel and butterscotch. And I know you are worth way more than a $4 bottle of hot sauce. You’re worth at least a jar of marmalade, too! JK – you are priceless! Oh @15c6de545671a68ae04c56bf70b24396:disqus ! I am so glad you stopped in! I know–it makes you re-evaluate everything when you find out that what you knew to be the truth…is NOT! lol I love both of them, but I’m on team butterscotch right now, because I love an underdog, too! And *you* are priceless, friend! Hi Jenni…..I stumbled across your site by accident today & have accomplished absolutely nothing since! My husband is going to shoot me! :p I’ve always loved to cook but my interest in baking really took off after having a stroke & losing the use of my left arm 3 1/2 yrs. ago. As I read this post, I read a little more about treacle. I’m originally from the Appalachian Mountains & there is a syrup available there that sounds like that. It’s “King” brand. It has an almost molasses type flavor but not as strong. PS ~ Thanks for the Sweetened Condensed Milk cheat recipe! It’ll be a money saver through the holidays! I say that, since you’re still here, it was no accident that you showed up! Tell your husband I said so! I’m happy you found me regardless. I’ve heard of King’s Syrup! I grew up in Charlotte, NC, and I know they used to have it on the shelves at the grocery although I don’t recall seeing it recently. Take care, and stick around! If you’re on facebook, do come play on my page. We have much fun there, and I try to be helpful. http://www.facebook.com/PastryChefOnline Take care! I can’t quite tell, but I think you talked negatively about Smucker’s Butterscotch topping? Not sure what cloud you’re from, but personally I think the stuff is great!! Heck, I’d eat it from the jar if it wasn’t so bad for me, lol. Lemon juice is not a flavor enhancer per se. It is citric acid, which keeps the sugar inverted. This prevents your mixture from becoming grainy upon cooling. I often use lemon juice as a flavor enhancer–to brighten flavors–in everything from chicken soup to tomato sauce. Since lemon juice contains a ton of citric acid, then I guess it would follow that it’s the citric acid that truly enhances flavors. The amounts of lemon juice in some of the recipes I saw seemed to contain more lemon juice than I would deem strictly necessary to combat any graininess. I wish you well peace and joy..
Oh PS, were can I find Curry hot sauce? You have brought me to tears. Food is so powerful. Peace and joy to you as well.